Brimham rocks is a National Trust site in North Yorkshire, which is home to some weird but very interesting rock formations that are great to photograph. As well as the rock formations there are many opportunities to shoot amazing landscapes. A quick and relatively easy climb up some of the large rocks will give you a breath-taking view of Nidderdale and other places in the distance such as Harrogate and RAF Menwith Hill. You can literally see for miles. I have taken many photos at Brimham but my personal favourite is a HDR Panorama I took on top of a large rock. Brimham is ideal for mad HDR's as there is no shortage of shadows and diferent light conditions. Personally I find taking photos at Brimham very rewarding in the evening when the sun is about to set, the place looks absolutely awesome on a summers evening. I hope to take some long exposures of the rocks at night in the near future as some of the photos found on Flickr are stunning. You are bound to get some good shots on a visit to Brimham regardless of the weather, just let your imagination run wild. You can find out more information about Brimham Rocks on the National Trust Website. Knaresborough is a small town near Harrogate in North Yorkshire. Knaresborough is home to a great range of photogenic places such as its river, gorge, castle and viaduct's. 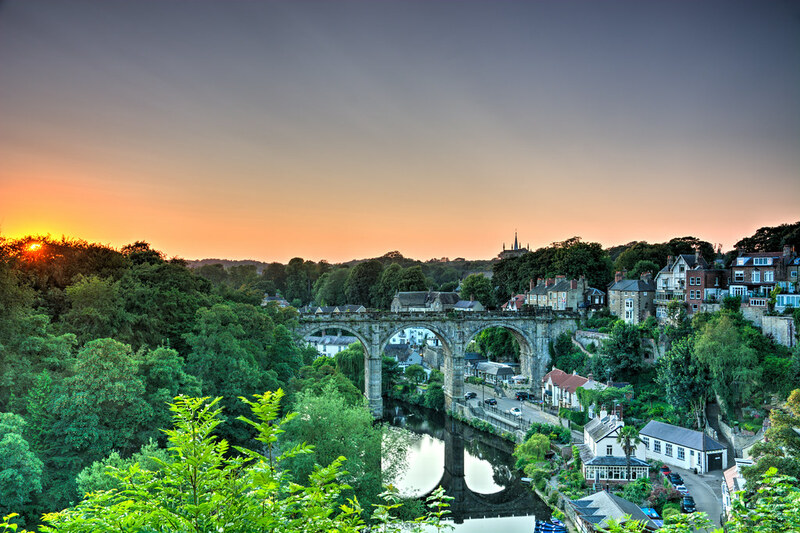 One of the best views in Knaresborough, is the famous view from the castle gardens overlooking the river Nidd and the viaduct. This is easily one of the most photographed places in the town, which is always great to shoot regardless of the time of day or year. I've taken many photos at this spot but my favourite time to take photos there is at night. The river is illuminated by lights from the surrounding houses and roads. It's a great opportunity for a long exposure, especially if the train is going over the viaduct. Just around the corner from the river view is the Castle itself which is fantastic to shoot. Again when illuminated it can look pretty cool at night. I plan to take some more shots here at night in the near future. The castle is mainly ruins but there's a small part which you can still pay to have a look around inside. Further down the river is Nidd Gorge which is home to another large viaduct, a bridge and a weir which are all surrounded by woodland. The weir and river are particularly great to photograph on a morning or evening. When covered in snow the gorge looks incredible and can make way for some attractive photos. Fewston and Swinsty reservoirs are located north of Otley, not too far from Harrogate. The two reservoirs are surrounded by countryside and woodland. Fewston is the main reservoir and is also the largest of the two. If you like landscape photography you'll like Fewston as it's bounded by many picturesque views. The reservoir also has a dam which is great to photograph with an ND filter and a slow shutter speed. Both reservoirs look good at sun rise and sun set and can really make some great shots. 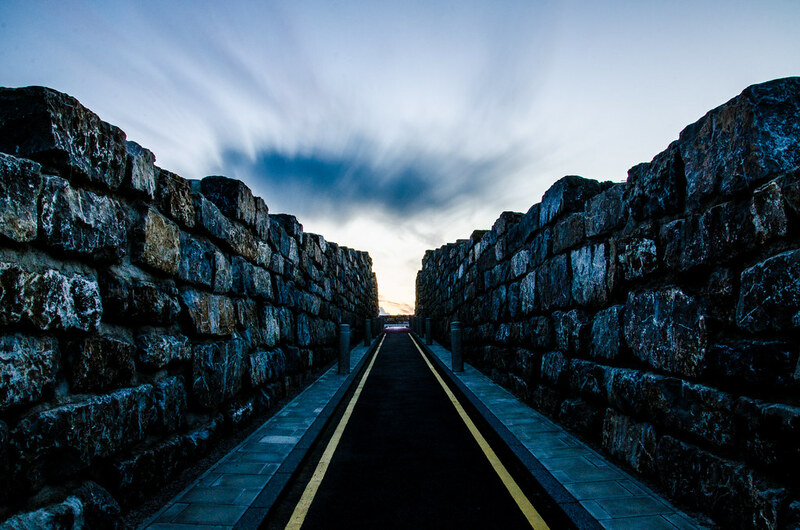 The Coldstones Cut is a large piece of public art near Pateley Bridge in Nidderdale. It mainly consists of a viewing platform at the top of hill which stands at 1,375ft above sea level. From the viewing platform you can see for miles and the most significant view is probably of the Coldstones quarry which is only a few meters away. The viewing platform also has a large metal disc that surrounds it; the disc has hundreds of well-known places from around the world engraved into it along with their direction and distance from where you’re standing. I only recently discovered Coldstones and have only being once. The views of Nidderdale are incredible and I will be going back in the near future to take some photos at night and early morning.